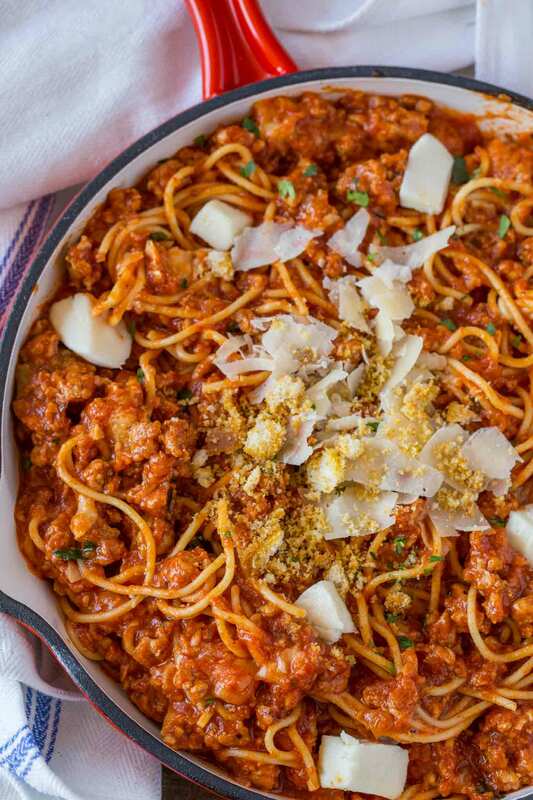 Chicken Parmesan Pasta made in just 30 minutes with ground chicken, pasta, mozzarella and Parmesan cheese baked in a skillet with easy Marinara sauce. 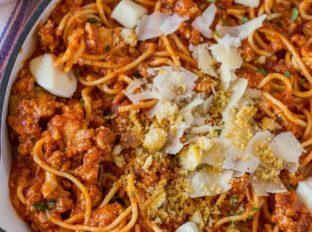 We’re taking a bunch of easy and quick shortcuts to all the delicious flavors from The Best Chicken Parmesan and creating a delicious baked pasta like our Baked Million Dollar Spaghetti that you all love so much! What can I say about this pasta? 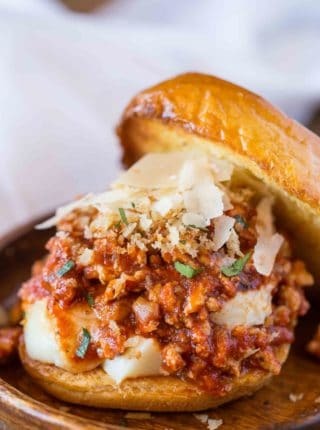 It’s so easy and with the switch to ground chicken (like in our Chicken Parmesan Sloppy Joes) we get an easy no-fuss dinner without worrying about chicken cooking through or drying out. It’s like an easy Easy Skillet Baked Ziti but with chicken. Plus the crispy topping. NEVER forget the crispy topping, that makes this baked pasta taste like a cross between chicken parmesan and baked ziti. Your kids will request it again and again and you can feel better about being able to use a leaner meat than beef and keep all those delicious crispy and buttery flavors. 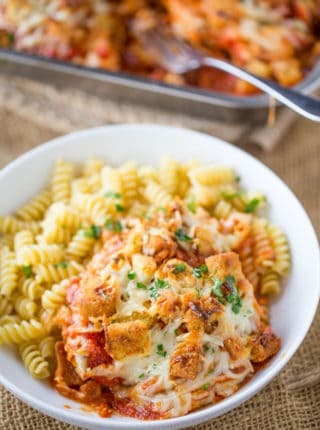 I bet if you serve this dish your guests would never guess the secret of the breading and they would LOVE it like this reader favorite Chicken Parmesan Casserole that uses the same hack! 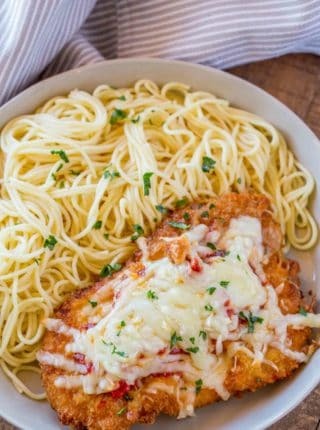 What to serve with Chicken Parmesan Pasta? 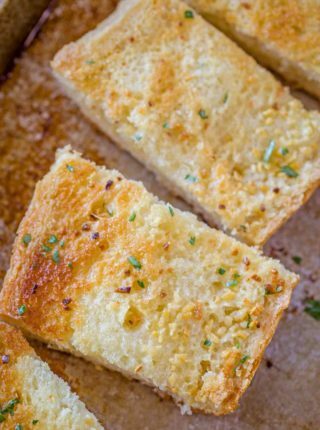 We love serving this with an easy salad (top it with this Olive Garden Italian Salad Dressing) and a side of Garlic Bread. Can you meal prep this baked pasta? If you would like to meal prep this pasta, the first thing is to toss the pasta with oil once it is rinsed. This allows it to coat the noodles to prevent excess liquids from being absorbed while it sits or from drying out. Second, if you can, add all the ingredients to the pan except for the sauce and the crispy topping the night before you plan to enjoy this meal. On the evening you plan to bake it, toss the mixture with the sauce and sprinkle the crouton mixture over the top. If you plan to freeze the meal, prepare the pasta with the extra oil then toss with the ingredients. Keep the breadcrumb topping in a ziploc bag taped to the bottom of the foil/pan lid and when you’re ready to bake sprinkle it on just before – if you add the breading then freeze it the croutons will become soggy before it freezes. We love baked pastas in our house. The process is so much easier than a classic Lasagna but the starchy, cheesy flavors are still present like in my personal favorite, Chicken Tetrazzini. Change the shape of pasta: I use thin spaghetti because it’s what I make with classic Chicken Parmesan, but you can use shorter noodles or even lasagna sheets and bake it off as a chicken parmesan lasagna. Add fresh herbs: You can’t go wrong adding fresh basil and oregano to this dish, it really kicks up the flavors. Use fresh Mozzarella! : I use regular mozzarella but fresh would be so delicious and indulgent. Swap turkey for the chicken or even use cubed fried eggplant instead of ground chicken for a fun change. Bake with broccoli in the pan for an all in one meal (quick tip I would coat the broccoli in olive oil, breadcrumbs and grated parmesan before placing gently in the top layer of the pan so the broccoli gets a nice browned crust on top). Use a mixture of butter, Parmesan and panko breadcrumbs to top the entire dish before baking for an indulgent crust. In a large skillet add the olive oil, on medium high heat and add in the ground chicken, salt, pepper, onions and garlic breaking the mixture apart while cooking for 5-6 minutes until the chicken is fully cooked through. Add in the basil, oregano, marinara sauce and mix well before adding in the pasta and tossing to coat the pasta with the chicken mixture. Dot the top of the pasta with the cubes of mozzarella, most of the parmesan cheese and the croutons and bake the dish for 20-25 minutes. Garnish with remaining Parmesan and additional crouton crumbs if desired. Would you be able to use pepper jack cheese instead? I’ve never tried it but if that’s the flavor profile you’d like, you can use it. How awesome, Mark! Thanks for coming back to let me know! Such a fabulous pasta dish! 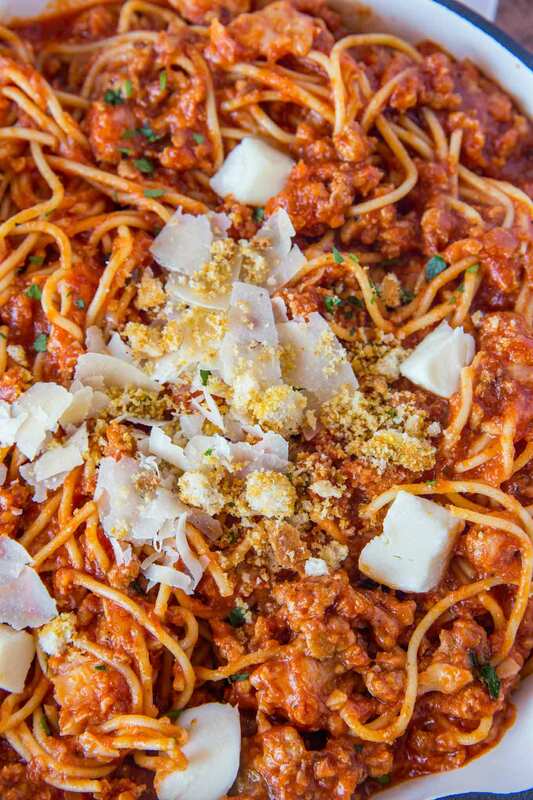 We eat a lot of pasta at our house and this one is super good! This is one of the BEST one pot dinners ever! So easy and so good! I made this for my sister – the chicken parm connoisseur and she absolutely loved it, too! How awesome! Thanks for coming back to let me know. I don’t cook with ground chicken nearly enough. This looks delicious! It’s such a great way to change up the normal dinner routine! I could eat this pasta every single day. Love it! I know, right?!? Soooo good!